The cutting-edge night vision technology allows you to get a clear picture even in completely darkness surwow camera with 10 infrared LEDs,and provide up to 26 feet of night vision. Maybe you do not want the infrared LED light to affect your baby or pet at night, you can turn it off or set the time to automatically turn on and off the infrared light. Receive real-time notifications whenever motion is detected. Surwow's safety Motion Detection/Tracking function accurately identifies, tracks, and records movement to help you keep up with everything. 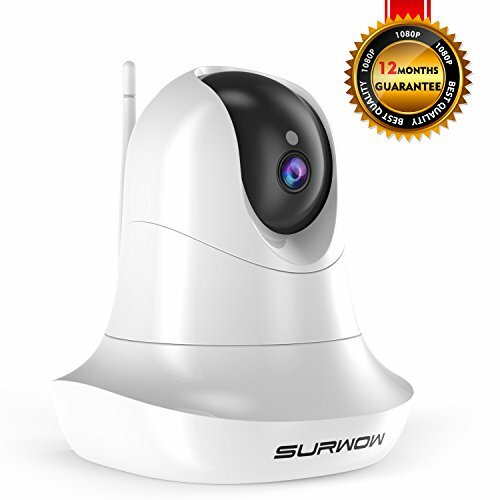 surwow Cam 1080p supports loop recordings of motion detected or continuous videos on local storage, A 64GB MicroSD card can hold up to 128-hour-long video with continuous recordings. Custom motion sensitivity settings tailor the alerts to your camera's environment. REMARKABLE FIELD OF VIEW: 90°wide-angle advanced optical lens combined with 340° horizontal & 90°vertical rotation range create a complete 360°coverage. Even in total darkness, Advanced night vision with 10pcs built-in infrared LED lights extend the viewing distance to 26 feet,supports remote Pan/Tilt, Intelligent Digital Zoom to watch every corner indoor with App. If you have any questions about this product by SURWOW, contact us by completing and submitting the form below. If you are looking for a specif part number, please include it with your message.